A handsome shrub or small tree, from ten to thirty feet high and growing in rich woods, often near streams. The flower clusters are composed of numerous, small, greenish flowers, forming a large, protruding knob, which is surrounded by large, white, petallike bracts, usually six in number, giving the effect of a single handsome flower, measuring from three to six inches across. 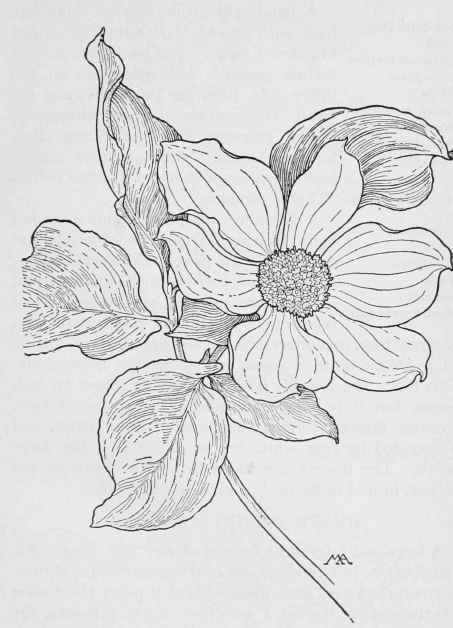 It resembles the Flowering Dogwood of the East, but as the flowers have six instead of four "petals," the tips of which in Yosemite are neither puckered nor stained with pink, they look different to eastern eyes and the general appearance, though equally fine, is less picturesque, probably because the shrub is rather larger and less straggling, the flowers bigger and more symmetrical, and the leaves brighter green. The effect of the flat masses of creamy white bloom among the darker forest trees is magnificent, and in Washington and Oregon the leaves turn to brilliant red in the autumn. The fruit is a cluster of bright red berries. The wood is exceedingly hard and is used in cabinet-making. There is a tradition that when Dogwood blooms corn should be planted. Pacific Dogwood- Cornus Nuttallii. HEATH FAMILY. Ericaceae.